How would you respond if you came face to face with the man who killed close members of your family during the 1994 Rwandan genocide? Would you have the strength and grace to forgive the perpetrator of such a shocking act? This was the challenging dilemma 24-year-old Alex Nsengimana had to face when he visited the Kigali prison, where he met the man who had taken the life of those so precious to him 19 years ago. Alex’s journey to forgive this man was sparked by a simple shoebox he had received as a boy through Operation Christmas Child (OCC), a campaign run by the charity Samaritan’s Purse in the UK. One day in 1995, all of the kids at Alex’s orphanage were asked to line up outside. Excitement buzzed like electricity in the air as they were each handed a colourfully wrapped shoebox. “Bursting with curiosity, we ripped open the boxes to find toys, school supplies, hygiene items – things we could hardly dream of owning were ours! These gift-filled shoeboxes, reminded us that someone cared for us. With that tangible reminder, a small flame of hope was ignited in my heart. But one day, as Alex read Jeremiah 29:11 in the Bible, he began to understand that God had a plan for his life. 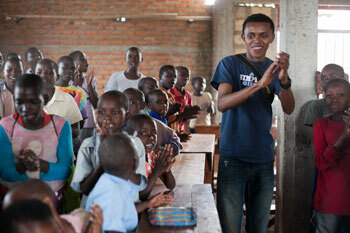 In 2003, Alex left Rwanda and moved to Minnesota, in America where God gave him another family to care for him. As he finished praying, Alex felt a weighty burden lift from his shoulders. Over the past 23 years, through the global efforts of Operation Christmas Child, 100 million gift-filled shoeboxes have been delivered to needy children, like Alex, in 156 countries around the world. Samaritan’s Purse is calling on churches, schools, businesses and individuals across the UK to help bring joy to another one million children through Operation Christmas Child this year. To mark the 20th anniversary of the Rwanda genocide next year, for the first time a container filled with gift-filled shoeboxes from donors in the UK will be sent to Rwanda. To make it easier for organisers to get hold of shoeboxes, Operation Christmas Child can now provide decorative ‘GO’ boxes, available flat-packed in cases of 100. These boxes can not only be used by individuals finding it difficult to find shoeboxes, but they can also be shared with their friends, families and work colleagues – anyone who has a heart for children!